Cleaining? CLEANING! What the ???? Don't worry, you don't have to clean! Yes, that's right! We'll do it for you! Your house is a state. There's 5 of you sharing a place, empty beer cans, take-away trays scattered all over the shop. A horrible greasy spill bang in the middle of the carpet. The oven looks like it's been dipped in a pool of chip fat, the bedrooms are covered in dust and there's coffee rings all over your desks. Don't worry about it. That's what we're here for! Removals4Students also offer a top of the range, prestigue, expert but most importantly, cheap as chips, cleaning service! Horray! You're prayers have been answered. You no longer need to worry about the state of your place and whether or not you'll get your bond back. 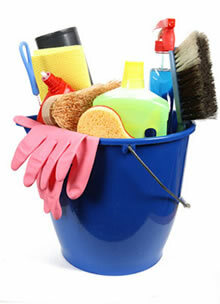 Our team of expert cleaners will come in and blitz the place. Once we have finished, your place will be fit for Royalty to dine in! Just drop us a message and let us know what rooms and appliances you need cleaning and we'll whisk in and do our magic. You'll be nicely shocked by the outcome! And that's not all, got some nasty holes in your wall from drunkern nights out? No problem. We also have a team of qualified decorators that can come in, repair blemishes and bring your place up to a standard that will get your hard earnt deposit back without any hiccups!